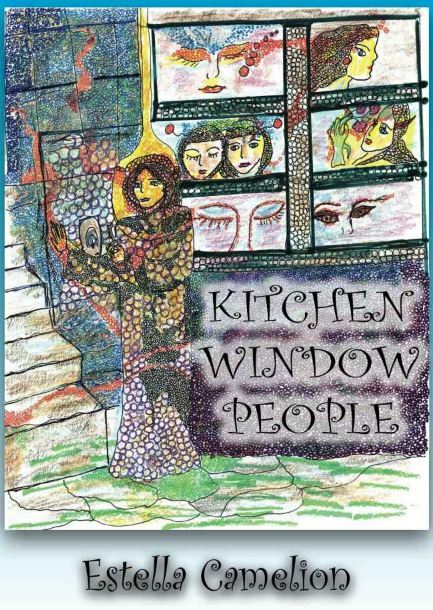 I recently had the joy of collaborating with the fabulously talented artist Estella Camelion on “Kitchen Window People,” her first art book (and mine!). What a lovely journey for both of us! Estella has been creating amazing art work for decades and was eager to collate some of her works into a book. I was eager to diversify my editing work into additional genres. And working with a talented artist? Sign me up! Estella and I met at a conference a few months ago, and our booths were across from each other. We hit it off immediately. She asked me to help her with her art book so it would be ready in time for a major show she was invited to in Nashville, and I was delighted! The book’s t itle is “Kitchen Window People,” and the process of creating the book actually took place around her kitchen table! I made several trips to her amazing 1901 farmhouse in rural Alabama, where we collaborated on putting this stunning book together among a lot of brainstorming, giggles, and perhaps a few jaunts through her lovely farm full of blueberries, figs, peaches, apples, glorious flowers and stately trees. ‘The Professor’ — her soulmate — joined the effort with his great technological experience and good ideas. Estella had a vision for her book – an essential for any good author. She’d selected the cover of her book (above, left) — a very canny choice, given the book’s spiritual (but not religious) contents. I helped her develop a system for organizing the zillions of possible of art pieces to include in the book and worked on a significant portion of the writing. As we sat around her kitchen table, something magic happened: We talked. We brainstormed face to face. We played with the possibilities. We weren’t creating a book by e-mail or Skype or texts or electronically shared files. In terms of the editing and collaboration process, “Kitchen Window People” was a kitchen table book, created in an atmosphere of eye contact, genuine camaraderie, laughter and mutual joy and excitement. (And yes, no book would be complete without its fair share of frustration — but there wasn’t much of that with this one!) Estella and I formed an immediate connection from our first meeting at the conference where we met, and it soared in our collaboration. At times, we found each other saying exactly what the other was thinking; sometimes, we sputtered our identical ideas at the same time. Almost always, it felt like this book and Estella’s art work, along with my words and coaching, created a sort of energetic thread that connected us to each other and to the work — like we were channeling through the art with synchronicity. Around the kitche n table — and occasionally, with a few telephone calls — Estella allowed me to help her create a book that awes me. Beautiful, spiritual, heartfelt, joyous, thought-provoking, insightful, powerful and deep, working on this book and in her presence fed my soul. Deadline was very much on our minds, but it wasn’t the ultimate driver in an incredible outcome. We decided to use few words in the book and let the art do most of the talking to its readers, because the art will speak differently to each person. Estella’s work will resonate with its readers from their own perspectives, but her observations in the book give us a glimpse of how her drawings (and her subjects) spoke to her. (Note the working copy of Estella’s art work to the left. 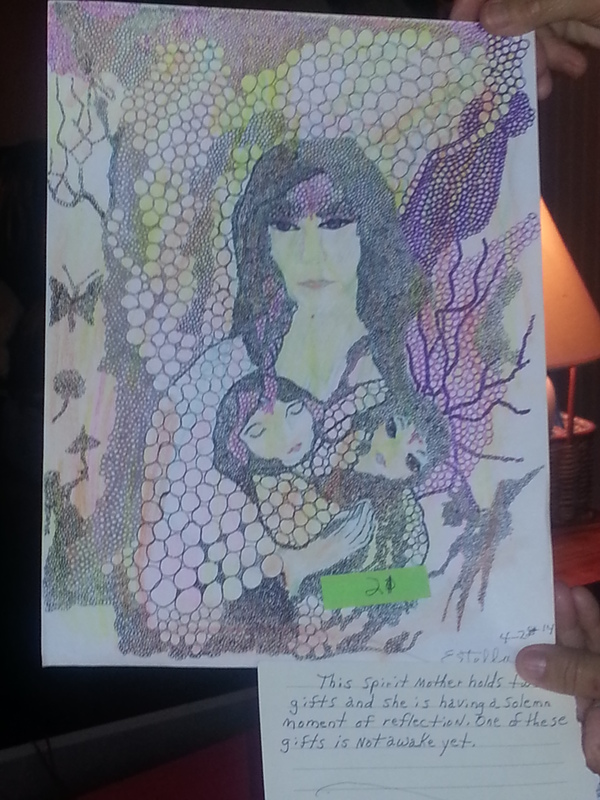 She summarizes the message that this particular work speaks to her in the note tag below it: “This mother holds two gifts, and she is having a moment of reflection. 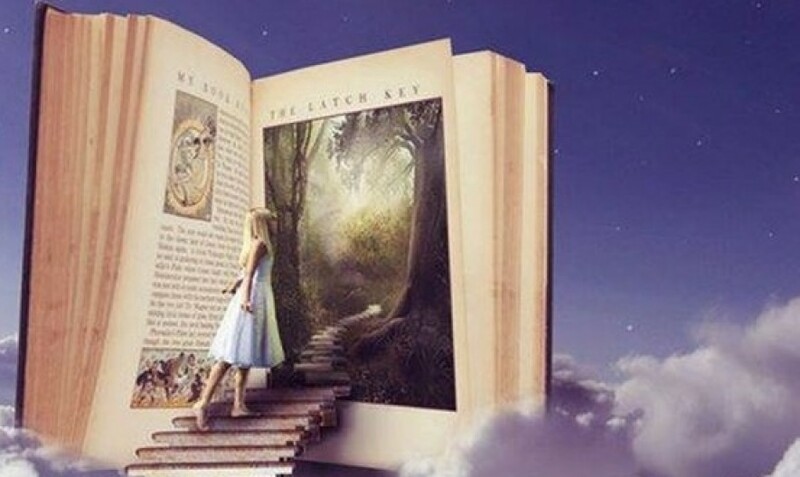 One gift is not awake yet.” ) Which of the reader’s gifts is not awake yet? This experience reminds me that technology, while imperative to creating an amazing literary work, may not be as non-negotiable or efficient as we often trick ourselves into believing. None of Estella’s images are computer generated — she drew the pictures herself, and her soulmate simply scanned them with no tweaks, editing or enhancements. As technology becomes more and more important in self-publishing, let’s not forget the joy — the kitchen table joy — of creating all of our art with love and laughter. Estella and I spoke by phone on Saturday. We laughed and laughed. Yeah, we talked about the book. But most of all, we talked about the joy. I didn’t tell Estella, but I sometimes wonder if the joy makes the book. Not the other way around. For more information about “Kitchen Window People,” visit http://tinyurl.com/ljesjab. Please also see the “Kitchen Window People” page on this blog for more information on the back story of of this book. I recently wrote about cliffhangers and how indie lit readers seem to have an angry mob mentality about them as a literary device, despite irrefutable evidence of cliffhangers’ recurrent success in pop culture and classics – and in multiple media: TV, film, books, video games, et al. And I expressed fear that great indie writers, their work, and our collective ability to nurture future generations of critical thinkers are threatened by the current mob-minded trendiness of attacking cliffhanger-based books. I was especially eager to read “Probability Chain” because I was so intrigued with Keeter’s risky format for his work. 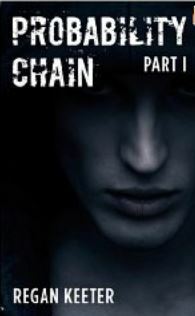 “Probability Chain” is a serial novel. Basically, you buy the novel in pieces. My review copy was eight chapters and 92 pages in hard copy format. Kindle downloads are 99 cents; hard copies are priced a bit higher. I love the way Keeter’s serial model celebrates the cliffhanger. When I finished Part 1, I was invested and ready to read Part 2 (which isn’t available yet – Part 1 was just released in September). I say, “Great! Leave me hanging!” And I mean it!